How can you set yourself apart from the competition, gain respect, acquire knowledge and invest in your future? By becoming certified! Join AOLP – Association of Outdoor Lighting Professionals today. AOLP offers certification programs (CLVLT) and ongoing educational and design programs that further your knowledge and expertise in the landscape lighitng industry. To become a CLVLT or sign up for the COLD program simply click on the links below. The CLVLT exam and COLD sessions will be held at the AOLP Annual Conference & Expo. This year the Expo is being held at the Hyatt Regency Hotel in San Antonio, TX the week of February 19 – 21, 2015. The annual AOLP Conference & Expo is praised among members for its educational and networking opportunities. It is also the perfect time to become certified. The CLVLT exam and COLD sessions are held in the few days prior to the conference at the hotel. Click here for the registration form. For more information on COLD, please click here. CLVLT Exam (Wednesday, February 18, 2015). Click here for the registration form. For more information on CLVLT, click here. If you have any questions about these certification programs, please contact Kelly at 717-238-2504 or certification@aolponline.org. 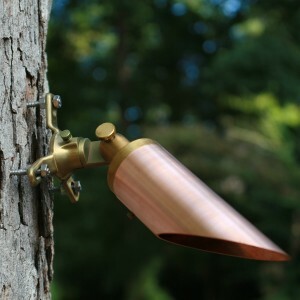 A Tree Light That Was Designed For Professionals By Professionals! Manufactured in ClaroLux’s facility in Greensboro, NC, USA – the new TL24-II copper and TL24-III brass down lights are designed from an installers’ point of view. By pulling together some of ClaroLux’s top Dealers, ClaroLux was able to design a landscape lighting tree light fixture that was not only installer friendly but also a fixture that will last a lifetime.